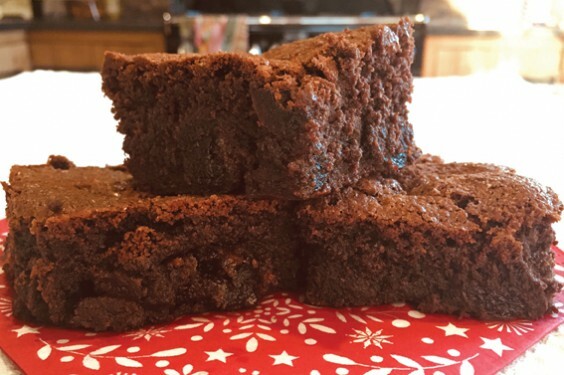 St Valentine’s Day is upon us and if there is someone whom you want to woo, these brownies could be the way to their heart. They are gloriously rich and decadent; a luxury for the one you love. They cut into 12 squares, so if you are hedging your bets on the romance front, there are plenty to share around! One version of the recipe also has white chocolate sprinkled over the top. For me, that is a step too far, but if your Valentine has a very sweet tooth, then don’t hold back! 2) Melt the chocolate and butter together in the microwave, by heating on high and stirring every 30 seconds. Once melted, set aside to cool for 5 mins. 3) Meanwhile, whisk the eggs and sugar together, until thick and pale. 4) Whisk the cooled chocolate into the egg mixture, then gently fold in the flour, baking powder and half the cherries, until just combined. 5) Pour the brownie mixture into the tin, then scatter the top with the remaining cherries (and the white chocolate chips, if using). 6) Bake the brownies in the oven for 40–50mins, until a skewer inserted into the centre comes out with just a little mixture sticking to it. 7) Remove from the oven and set aside to cool completely in the tin. 8) Once cool, cut into squares and serve.